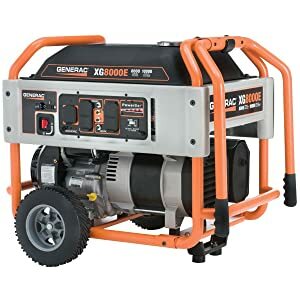 Generac XG8000E comes with many of the standard features found in portable generators plus a few extra which I think you’ll like (I’ll get to those in just a moment). Following through and purchasing this generator can save you time and hassle on your next RV trip. Let’s get down to the nitty-gritty details and find out if this is the right generator for you. Generac XG8000E comes complete with three separate outlets. It has one L14-20R (120 volt) outlet and two 5-20R (one 120 volt, one 240 volt) outlets, the latter are a couple of twist outlets while the former stands alone, allowing you more options. This keeps it suitable for a wider variety of situations. It comes with a wide array of protective measures meant to increase its lifespan. Splash lubrication keeps its engine running smoothly for longer while increasing its overall reliability. A steel tube cradle acts as a set of ‘armor,’ helping to protect parts within the generator. Lastly, an automatic shutdown feature kicks in when the generator begins to run low on oil, further increasing its lifespan while reducing the occurrence of performance issues. A low level of operating noise further increases its usefulness in any situation you might find yourself in. It’s definitely quieter than plenty of other generators with higher wattage. Generac G8000E runs purely on gasoline, making refilling it at the has station a breeze. Like many of its features, this simply serves to add another layer of convenience and versatility onto the generator. It’s durable, reliable and should have a great lifespan. All of its protective measures, such as its auto shutoff feature, durable cradle and lubrication system may very well have you saving a decent sum of money in the end through a low occurrence of repairs or all out replacements. The size of the fuel tank is quite large for a portable generator as well. It can hold 4 gallons of gasoline at any one time. Coupled with its long running time at half of its maximum workload, you should get enough time to fully power a mid-size RV. Lastly, its variety of outlets are a great convenience. While not out of this word at three outlets, it’s certainly above par in this department, considering its portable status. It’s more expensive than some of its competitors equipped with higher wattage. When a 10,000 watt generator is slightly too big and a small-size portable generator is too small, Generac XG8000E offers a good compromise. In the end, this is a quality generator who’s power outweighs its size and who’s bang outweighs its buck. Although I wouldn’t call it the best model offered by Generac, you still can’t really go wrong with it.